Lewis Hamilton says he was wrong to accuse Sergey Sirotkin of "disrespectful" driving in Brazilian GP qualifying. Hamilton claimed pole position at Interlagos but nearly collided with Williams driver during Q2 when they came across each other at vastly-contrasting speeds. The world champion was travelling slowly in preparation for his next fast lap when Sirotkin arrived at a rate of knots behind. Hamilton moved left in an attempt to allow the Russian through, but Sirotkin took the same line and veered onto the grass to avoid a collision. Hamilton initially said the Russian's driving had been "completely unneccessary" and added: "Between all the drivers, we all know to keep our space by that point so it was generally quite a disrespectful move." 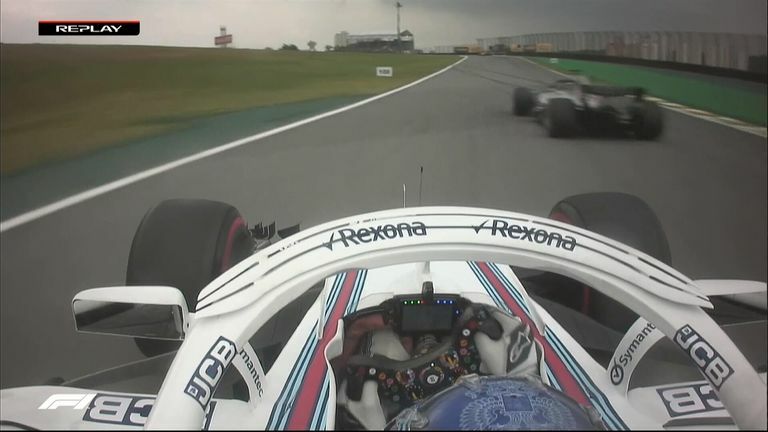 But Sirotkin explained that he was only driving so fast on his out-lap to try and heat up his tyres - Williams hadn't expected to reach Q2 - and Hamilton took to social media on Sunday morning to clear up his comments. "Morning world. I woke this morning feeling I should correct some of the words I used yesterday," he posted on Instagram. "I was wrong, it wasn't a disrespectful move by Sergey, It was a misunderstanding and I honestly attempted to get out of his way. "Didn't work that well but s*** happens and I respect the way he handled it." The Interlagos stewards did not launch a formal investigation into the incident. Watch every Formula 1 Grand Prix, qualifying and practice session live in 2018. Get Sky Sports F1.